This is a story about several individuals who were homeless but were saved by the internet and social media, with different stories to tell, but all equally inspiring, awesome and mind-blowing. Xi Li Ge wasn't just any old beggar off the street before becoming an Internet celebrity and fashion icon. He was also a guy with the fashion sense of an avant garde stylist, who could run with the best of those guys who act like they're too good for you on television, matched with the broody demeanor of a tortured poet and the cheekbones of a Dolce & Gabbana model. Basically, this guy was BUILT for fashion. 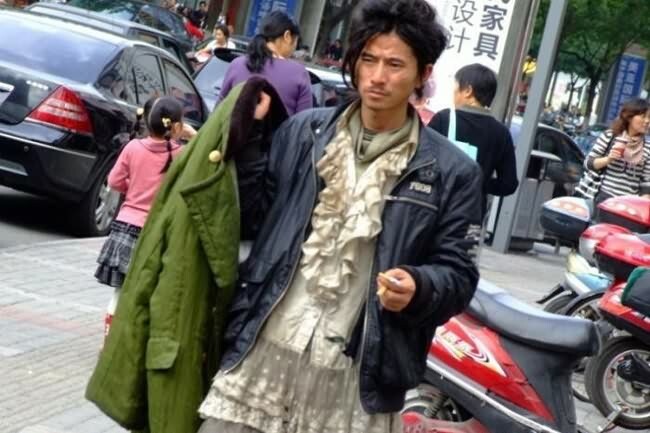 Xi Li Ge, or "Brother Sharp" as he's more commonly known in the fashion webosphere because of his "sharp/penetrating eyes", first attracted the attention of fashion lovers in March 2010 when someone testing out a camera accidentally photographed him and uploaded the image to the Internet. In the photo he's wearing a coat over a leather jacket, sporting full locks of messy hair and smoking a cigarette while walking down a road in Ningbo, China. He was, though, after all, homeless. So... His internet popularity soon allowed him to sign with a fashion company, walk a fashion show in Guangzhou, be a subject of a huge painting on the street of Hangzhou and, now, have a movie in the works based on his story. Billionaire Yang Meimei announced in July that she plans to invest RMB 70 million to produce the movie and Hong Kong model-actor Carl Ng is rumored to play "China's sexiest homeless man". This guy wins. At everything! "I have a God given gift of voice. I'm an ex-radio announcer who has fallen on hard times. Please! Any help will be gratefully appreciated. Thank you and God bless. Happy holidays." 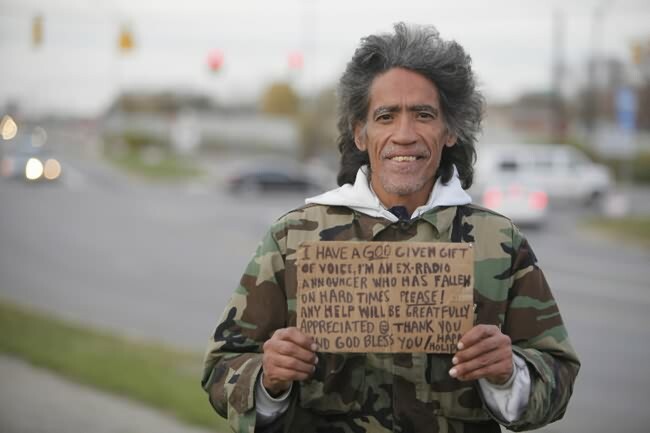 Those were the words that Ted Williams held up on a cardboard sign in the first week of 2010 to commuters driving down Ohio's I-71 in hopes to get a job or, even more pressing a motel room to sleep in at night. Just 24 hours later after a video was posted of him exhibiting his voiceover talents to a passerby who decided to put it on YouTube, Williams has already received numerous offers from prestigious companies like the Cleveland Cavaliers (who also offer housing), MSNBC, ESPN and MTV. He's been interviewed on various television shows and on Thursday, January 6 of 2011, he introduced NBC's Today Show. Just two days after living on the street. On the popular website Reddit, people have donated a cellphone, business suit and over $1,000 to help jumpstart his career. Williams has already made appearances on "The Early Show" and "Good Morning America" and is set to do a taping with "Late Night with Jimmy Fallon" and "The Last Word with Lawrence O'Donnell". Most recently, he's been offered a job by Roger Ebert, who wants him to do an Orson Welles impression for his new show. There are plenty of people who use the Internet to make a living, but Eric Sheptock uses the for Internet homelessness-based activism, all while being homeless himself. 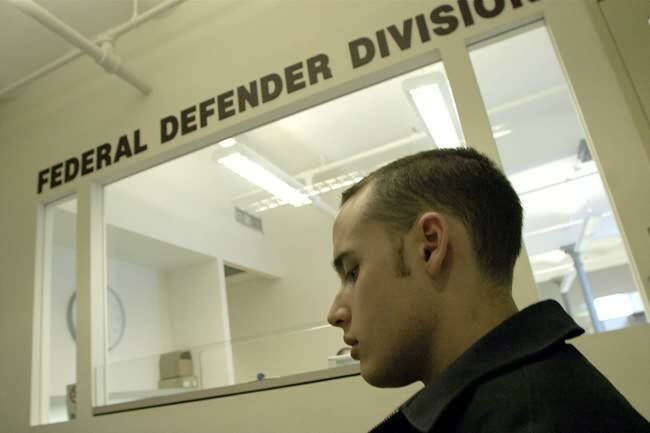 Sheptock refuses to work a 9-to-5 job or move out of the shelter where he shares a room with eleven other men in downtown Washington, D.C. in order to continue his unique ability to advocate for others in the same situation. He has about 5,000 Facebook friends, 1,200 followers on Twitter and thousands of emails notifying him of press mentions. But Sheptock is interested in only one thing, to spread social justice using social media. He's also a blogger and is a known speaker of the National Coalition for Homelessness. So far, he's been able to get a leak fixed at a homeless shelter and stop harassment at another through his continual messages for change on the Internet. It's always the smart people who get caught. In this case, it's Adrian Lamo, who was arrested in September 2004 by the FBI for computer fraud. He was charged with breaking into the private network of the New York Times Company and running a bill upwards $300,000 on the pay-per-use search tool Lexis-Nexis and a possible 15-year prison sentence. This wouldn't be too surprising if Lamo was a Ivy-League graduate with a rebellious streak (we've all seen Social Network three times by now to get the picture), but Lamo, one of the best-known hackers in the country, was homeless. Given the name "The Homeless Hacker" by some, Lamo traveled around with just his eight-year-old Toshiba, blanket, change of clothes and Taser stun gun which he used to shock vending machines to see if they'd drop any food or spare change. He did most of his virtual exploring from the internet connections of Kinko's copy shops, which if you wear the right stuff, is actually pretty smart if you're a hacker (assuming you're paying in cash). 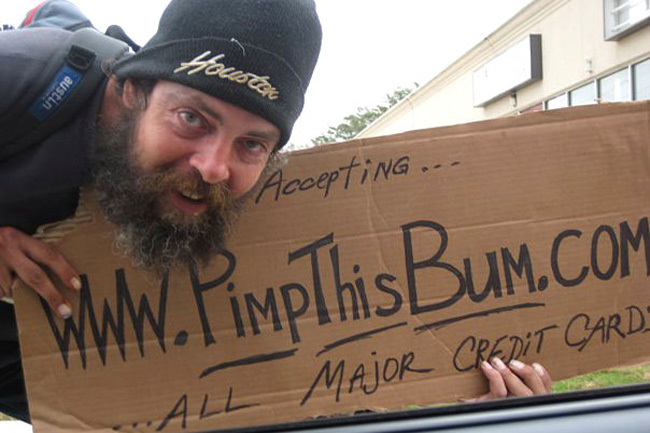 Pimpthisbum.com is a father-and-son run website that raises money for one lucky homeless person. It follows the story and rehabilitation of Tim Edwards, a man who was found homeless and an alcoholic under the 1-10 overpass at Highway 6 in Houston. Once he and the Dolans (owners of the site) met, it was a moment in internet-homelessness history. He began carrying a cardboard sign with the website url scrawled on it and donations began pouring in. Soon enough, he was remitted into a rehab center in Seattle for free, reunited with his long-lost family and got a job as an apprentice machinist. All for pimping his own URL on the street. James Montgomery may not have a home but he calls the sky his home and the internet his outlet. Unlike everyone else on this list, he isn't now rich, famous or 100% assimilated back into normal society. The internet and music can provide an outlet for someone who would regularly dive off the deep end with drugs or alcohol that can end up saving their lives. After having his guitar and amplifier stolen at a bus transfer station, he had to make a decision, to keep playing jazz and rock at the public station or buy a computer. He decided on the latter and purchased a $400 Dell laptop from a pawn shop and moved to Lodi, CA in the San Joaquin County which he found to be much safer than San Francisco. There, Montgomery started writing about metaphysical philosophy using the internet connection at the Lodi Public Library as well as reading books on the subject. 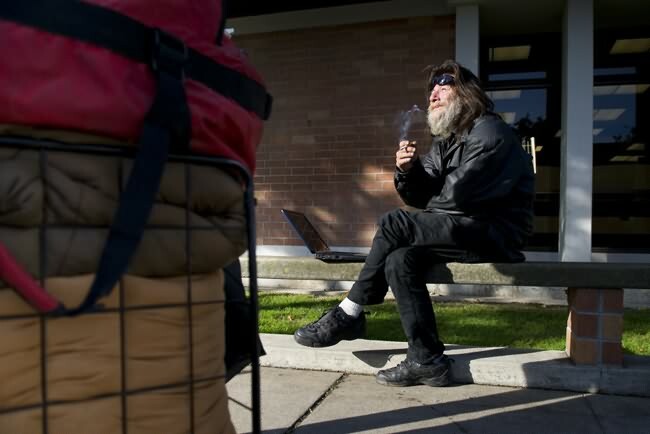 The Lodi News-Sentinel has reported on the man who stays connected to the world, though he doesn't have a home, through the Internet. It's something that keeps him sane, something that keeps him thinking and something that drives him forward to enjoy his life every day.